CEO Marchionne said Fiat is "reconsidering" its plans for the Grande Punto subcompact. MILAN (Bloomberg) -- Fiat is cutting investments in Europe by 500 million euros ($632 million) on expectations that the region's auto market won't recover in the second half. "The capital expenditure reduction is about half a billion euros from what we planned last year for 2012 in Europe," CEO Sergio Marchionne said late Thursday in an interview in Madrid, where he's heading the annual gathering of the European auto association ACEA. A recovery in Europe "depends on many factors: first Greece, then the way in which the euro currency will continue and what Europe will do to sustain growth," the CEO said. Fiat, which owns 58.5 percent of Chrysler Group LLC, has stopped additional investments and postponed the introduction of new models in Europe. Marchionne, who is also CEO of Chrysler, plans to eventually merge Fiat and the U.S. carmaker in a bid to increase sales to more than 100 billion euros by 2014 and reduce the Italian manufacturer's reliance on Europe. Marchionne said that the new Grande Punto model, which was originally scheduled to be built beginning in 2013, "is one of the projects we are reconsidering in line with the changes" to the market in Europe. Fiat is discussing partnerships "with several people, and in some cases our architectures, including the one for the Punto, are involved in the talks," he said. "We're definitely going to be at these lower sales levels for some time to come in Europe,"
Richard Hilgert, a Chicago-based analyst for Morningstar Equity Research, said by telephone. "It's going to be a long, slow recovery over there, and Marchionne's focusing more on growth outside of Europe." Fiat will pay less than 200 million euros to increase its stake in Chrysler by 3.3 percent to 61.8 percent, Marchionne said. 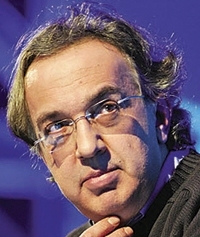 Fiat already sent a letter to exercise its option, Marchionne said in the interview outside a Madrid hotel. The CEO said there won't be "any spectacular news" on a full acquisition of Chrysler in the second half. Fiat is not currently in talks with the United Auto Workers' retiree health care trust, VEBA, to buy its remaining holding in the U.S. carmaker, said Marchionne, who added that he'll switch off all his mobile devices to celebrate his 60th birthday June 17. Fiat is not considering an initial public offering of its Ferrari supercar maker to finance an acquisition of Chrysler, the CEO said. "We have enough cash." Fiat may pay about 3 billion euros to buy the rest of Chrysler, Max Warburton, an analyst at Sanford Bernstein wrote in a note to clients May 21. "This is an excessive sum for me, have a look at General Motors Co. multiples," Marchionne said. European carmaker CEOs meeting in Madrid haven't made any progress on a common plan to address the region's overcapacity issues, Marchionne said. "I think my proposal will just remain a Marchionne idea," he said. "If there's no coordination by the European Union," every carmaker in Europe will "do it by itself," he said before a gala dinner with the other executives.